“Ride-sharing and truck platooning, and even flocking birds and formation flight, are similar problems from a systems point of view,” says Sertac Karaman, the Class of 1948 Career Development Associate Professor of Aeronautics and Astronautics. “I grew up in Turkey, where there are two types of public transportation buses: normal buses that go out to certain time units, and another set where the driver will sit there until the bus is full, and then will go,” Karaman says. In their modeling of vehicle platooning, the researchers analyzed many different scenarios under the two main scheduling policies. For example, to evaluate the effects of timetable scheduling, they modeled scenarios in which platoons were sent out at regular intervals — for instance, every five minutes — versus over more staggered intervals, such as every three and seven minutes. 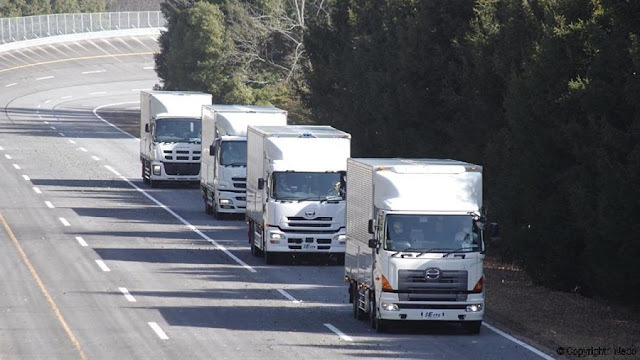 Under the feedback policy, they compared scenarios in which platoons were deployed once a certain number of trucks reached a station, versus sending three trucks out one time, then five trucks out the next time. Ultimately, the team found the simplest policies incurred the least delays while saving the most fuel. That is, timetables set to deploy platoons at regular intervals were more sustainable and efficient than those that deployed at more staggered times. Similarly, feedback scenarios that waited for the same number of trucks before deploying every time were more optimal than those that varied the number of trucks in a platoon.